Altior could renew rivalry with Irish raider Un De Sceaux, who has won this race in each of the last three seasons and at least gave Henderson’s charge something to think about when they clashed in the Tingle Creek at Sandown last month. Norton handler Ruth Jefferson could run Waiting Patiently following his unfortunate early exit in the King George VI Chase at Kempton. Nicholls has Diego Du Charmil too, while Colin Tizzard’s Fox Norton, Harry Fry’s Hell’s Kitchen, the Tom George-trained God’s Own and Harry Whittington’s Saint Calvados round out the potential field. Henderson is still at a loss to explain Might Bite’s lacklustre effort in the King George. The 2017 winner was last of seven finishers after posting a similarly disappointing effort in the Betfair Chase at Haydock on his seasonal bow in November. 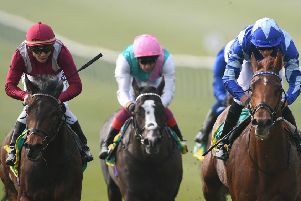 Might Bite was reported to have bled following the King George, but further tests have so far failed to produce an explanation for his below-par form this term. Henderson said: “He is fine and I can’t tell you any more as I don’t know any more. He had an exercise on Monday and Toby (Lawes, assistant trainer) rode him out. “We can’t find anything and they (results) were all right. We are considering dozens of things as there is something not right, that is fair to say. Where we find it, goodness only knows. Tornado Flyer, meanwhile, is likely to head Willie Mullins’s assault on the Lawlor’s of Naas Novice Hurdle as he bids for an eighth win in the Grade One at the County Kildare course on Sunday. The 17 possibles also include the unbeaten Battleoverdoyen, one of five horses who could represent trainer Gordon Elliott and owners Gigginstown House Stud. Meade is eyeing compensation in the Irish Gold Cup for Road To Respect following his luckless run at Leopardstown last Friday. After making a scintillating reappearance in the JNwine.com Champion Chase at Down Royal in November, the Gigginstown-owned eight-year-old was favourite to successfully defend his crown in the Savills Chase. However, he stumbled badly on the run to the second fence from the finish, shuffling him back in the field to take third. Last season, Road To Respect went straight from Christmas to the Cheltenham Gold Cup – finishing fourth – but this time he may return to Leopardstown for the Irish Gold Cup on February 3.